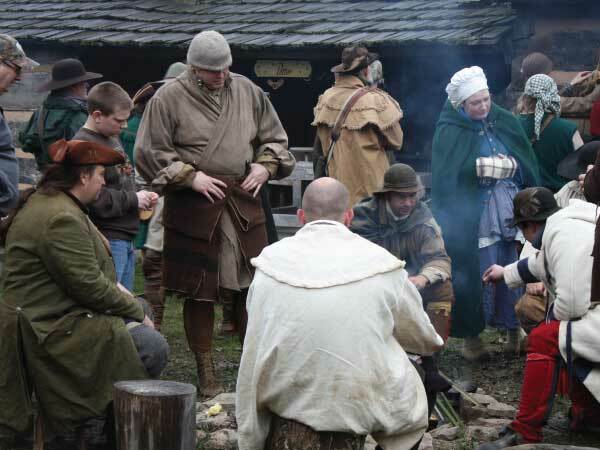 When you visit the reconstructed fort today, you will find historical interpreters dressed in 18th century frontier clothing and involved in activities which would have been found on the Virginia frontier at the time: farming, spinning, weaving, carpentry, blacksmithing, and repairs to buildings, tools and weapons, as well as other activities. The interpreters, working as laborers and artisans in the fort, will be able to talk with you about their activities, both as they existed on the early frontier and as they developed later, when the first communities were beginning to appear. The reconstructed fort you see today represents the original fort as it would have been found during a period of quiet. You will probably not see any militia activity, unless you are here for a special event. You will, however, find most of the weapons and equipment used by militiamen and be able to talk to interpreters who are knowledgable about militia functions and weaponry. The Prickett family continued to live on the original Prickett homestead for just under two centuries: from the 1770's until the 1960's. About 1859, construction began on what is now referred to as the Job Prickett house, and it is this structure which still stands, a mere stone's throw from the reconstructed fort. After visiting the fort, you might consider taking a tour of the house. To do so will be to move forward through the history of one family, and this history of the country, almost ninety years, from the eve of the American Revolution to the eve of the Civil War.